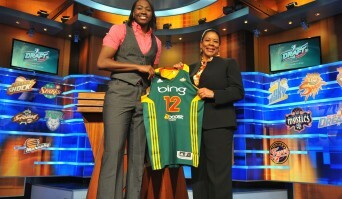 ESPN announced yesterday that for the first time in league history of the WNBA draft will be televised live in prime time. On April 15, 2013 at 8:00 p.m. you can turn on ESPN 2 and watch the first round starting with the Phoenix Mercury who won the draft lottery last year amid a chorus of complaints that it tanked its season. So why is this the year ESPN decided to put the draft in primetime? Posted December 12th, 2012 & filed under Entertainment, Sports.